During the first Saturday of February 2018, I was downtown Tampa for an event. This event was planned by friends and we carefully plan these outings when there is no sporting event. Our goal being we have less stress dealing with parking and people everywhere. Downtown Tampa isn't exactly built for large events as the location is the same place as the cruise ports and large aquarium. Point being, February 3rd 2018 was suppose to be a relatively calm day. Except, I was slammed with "EVENT" parking signs everywhere. There was no turning around at this point - our event would go on - so I paid some insane parking fees and started my walk to the park. WE’RE TAKING OVER AMALIE ARENA AND PAINTING THE TOWN WITH BLACK, GREEN, AND BLING BABY! ONE thing’s for sure—we’re flipping the script on Conference and everyONE will be talking about this ONE for years to come! Now’s your chance! It’s time to get in the game and secure your ticket for ONE 2018! This is the stage of all stages and the perfect opportunity to immerse yourself into the culture of family that is It Works! because it really will Change Your Life! I was early to my event and this interesting group of people caught my attention. I had no ticket so I couldn't enter Amalie Arena, but you could easily hear voices and music blaring through doors. In just a few minutes, not even being inside the event, my "Ponzi" scheme senses were tingling. Spending the last few weeks in the cryptocurrency world, Ponzi Schemes have become so common that this trip downtown felt like one. I stood in a crowd of what I learned to be some expensive event and watched some stay at home mother discuss quitting her job, finally spending time with her kids because she joined It Works! enabling her to work on her time. Calling this company a "ponzi" scheme wouldn't be right, because they actually sell a ton of products. The usability and quality of those products is another story. One can just peek at the Amazon reviews to see that. This is more known as a Multi-Level Marketing Scheme which I feel is about equal with a Ponzi Scheme. These schemes work just like a pyramid scheme, which is even clearly put in interactive graphics by the company itself. I even snipped the graphic as it just gets more confusing. Instead of the traditional pyramid shape, this company tries to confuse with showing a mess of colors and terms across some hierarchical chart. I was already convinced, but decided to do some research as I only experienced the "fun" rally of the event. Onetime purchase at retail price of an It Works! product. Signup for recurring products through a Distributor. The members of the business who sell product to other distributors building this "pyramid"
One of the quotes from this document says - "The more customers you have the more you will earn - directly through your own commissions and indirectly by the sales commissions of your team and Distributors." So I continue reading this mess of a document being thrown terms like BV, PBV and GV. Which all just basically mean volume at the end of the day. This company pushes you to make more money by recruiting more to work under you. This gives you the percentage of their sales and as the chain grows more and more people provide commission to distributors higher than them. So I wondered, why join a Distributor chain when I could instead start my own? Crawling the website, it seems my "setup" fee was $99 on my own vs $49 through a Distributor. So right out the gate they draw and entice joining under someone. I was shown a signup page allowing me to pick a username for my own "myitworks.com" page. This had a disgusting 10$ a month paired with another 10$ a month fee for website & admin reasons. From a developer, creating these "website" clones costs exactly $0. These are just fees to prey on the ill-informed member. I about screamed reading the rest of this legal document that I just stopped researching further. There are fees for re-stocking items in case of returns, fees if the address is invalid, fees for someone canceling before a 3 month cycle ends. So I wanted to dig into the profits and thankfully (or maybe by Law) the entire 2016 year of profit was published. This is the wonderful image below. If you are a member of It Works! and you are reading this, I hope this is enough proof for you to take another direction in your life. Unless you of course are a Diamond extreme platinum whatever member, in which case, keep up the charade you are doing while your peers barely slide by! 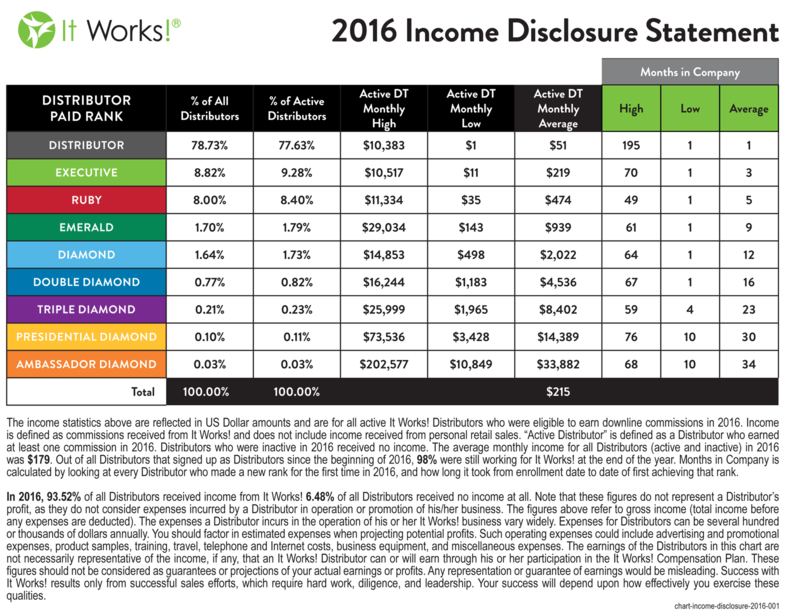 This document shows that 77.63% of distributors make between $10,383 and $1 monthly. Yes you read that right. $1 of monthly income. These are the "pawns" of the pyramid. Some of the profits of these low tiers climb the pyramid all the way to the top. So lets look at the Ambassador Diamond plan. Only .03% of distributors reach this level and make between $202,577 and $10,849 a month. I hope you see the picture now. By the time we complete the chart of an Ambassador Diamond, this individual would have 5 people working for them, which each of those 5 people also have 5 people working for them. The requirements for each leg is slightly different, but don't worry - I'll do the math. Boy that took awhile. So time for some math. We will build each "group" by the amount of humans required. [AD] Ambassador Diamond = (1PD + 2TD + 2DD) = (131 + (2 * 66) + (2 * 30)) = 323 humans. So in an easier to consume format. You need this many people working under you per plan, starting at the top. So back to the above image (source) we see that the monthly average income for ALL distributors combined is $179, including the fact that 6.48% made no income. If you feel you can recruit 323 people to work for you, day in and day out bugging people selling a grossly overpriced product, then It Works! is for you. However, anything less than the top of the pyramid is simply not worth it as you will more than likely bring in $179 a month. Regardless of that, where do you think those fees are going? There are levels probably not even described on the above image because those people don't consider themselves distributors. If that didn't convince you enough, take a look at the 2013/2015 reports below. 2014 for my hour of research could not be located. So lets just look at the average rate from 2013 to now. If the average for the smaller tiers continues to dwindle will they stay as Distributors? Probably not, which in time will drop the "rank" of the people they were connected with. This in time will drop them to a lesser pay per month which will slowly collapse itself. I don't imagine It Works! to be around in a few years. All this research because I stumbled into their large conference. Let me repeat it again - It Works! is a large Multi-Level Marketing Scheme. Do not take part in it.